The rumor is that this overnight unofficial visit will take place sometime in March. Expect more details to come as we get closer to the visit. Moeller Senior RB and Northwestern commit Keith Watkins is a fantastic young man and a superb athlete. The idea that these two wrecking balls could be on the same offensive team, tearing down defensive opponents together while representing the GCL South... that would be very exciting for many GCL fans. 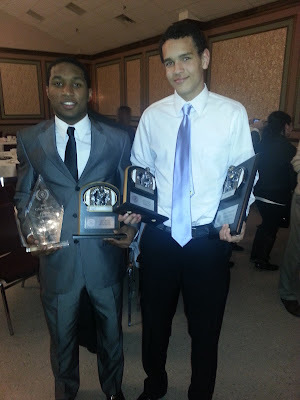 The picture above is a flashback from the 2012 GLC All Star Banquet. A couple of minor adjustments were made after learning Watkins will be playing defense back for Northwestern.